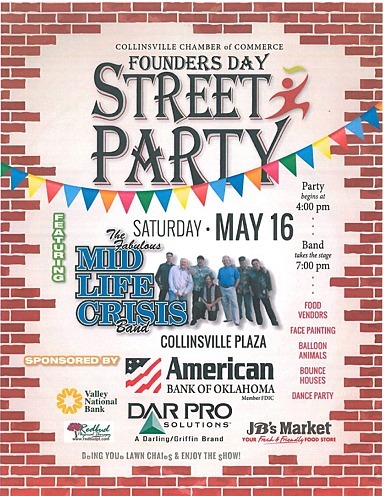 Collinsville, OK (May 4, 2015)  The Collinsville Chamber of Commerce is planning their Founders Day Street Party featuring The Fabulous Mid-Life Crisis Band for Saturday, May 16, 2015. The event will begin at 4:00 pm with lots of family friendly activities including bounce houses, face painting, balloon animals and more! Performances from local dance and martial arts studios will also take place between 4:00 pm and 6:00 pm. A DJ will be on-hand playing crowd favorites to get everyone in the party mood before The Fabulous Mid-Life Crisis Band takes the stage at 7:00 pm. A variety of food trucks will be on-hand serving BBQ, Cajun, Asian, kettle corn, shaved ice, hamburgers and more. The Chamber still has space for non-food commercial vendors. The vendor fee is $50 and only one vendor per industry will be allowed on a first-come, first-serve basis. Event sponsors include American Bank of Oklahoma, Dar Pro Solutions, JBs Market, Valley National Bank and Redbud Physical Therapy. For more information, contact the Chamber Office at 918-371-4703 or melissa@collinsvillechamber.org. Wilson Elementary students are closing up the school year learning about the character trait of self-reliance. We have learned a lot and are becoming more independent and self-reliant in our everyday lives. Self-reliant means being confident in your own abilities and able to do things for yourself. The quote we're learning is a pretty good one: "The best place to find a helping hand is at the end of your own arm." Anonymous. We think that pretty much sums up being self-reliant! Under Oklahomas Constitution, the legislative session must conclude no later than 5 p.m. on the last Friday in May. Our goal is to try to conclude our work as soon as possible so that we can adjourn before that deadline. This would enable us to save a small portion of the cost of the legislative sessionthings like mileage, per diem, part time, session-only salaries and other session-related expenditures. This past week we concluded the last of our Senate Appropriations hearing on the 12 agencies that receive the vast majority of all state funding. With the information weve gathered from those hearings, we will work to develop the final framework for an agreement that will enable us to complete our most important task of the session, determining how best to handle the $611 million shortfall in a manner that funds our most critical services within the context of a balanced budget. Right now we are continuing to work on bills impacting public policy, although many of those have already been sent to the governor for consideration and signed into law. Among the measures already signed by the governor are House Bill 2182 and Senate Bill 806, both of which I had the honor of presenting in committee and on the floor of the Senate. These measures will require all business tax incentives to be objectively evaluated at least once every four years and require future incentives to include measurable goals. These measures were dedicated to Representative David Dank, who died last month. He was a longtime advocate for tax credit reform, and liked and respected by members of both political parties in both chambers. Governor also signed HB 2154 into law. The bill authorizes a medical pilot program allowing the medically supervised use of cannabidiol (CBD), a low THC non-intoxicating derivative of marijuana. Some families have testified that CBD may be used to effectively treat children who suffer from epileptic seizures and help reduce the number and intensity of those seizures when all other medical efforts have failed. Known as Katie and Caymans Law, it was named for a child who was the relative of the House Author and a family friend of the Senate author, both of whom suffer from seizures. Another bill signed into law this session deals with the issue of abuse and financial exploitation of older Oklahomans and other vulnerable adults. According to a report by the CDC, one in 10 older Americans reported emotional, physical or sexual mistreatment or potential neglect. AARP reports that every year in this country, abuse and exploitation rob older Americans of $3 billion. Financial abuse can come at the hands of a nonfamily member who is hired to provide care, or even a trusted friend or family member. Senate Bill 725 will prevent anyone who has been convicted of abuse, neglect or exploitation of a vulnerable adult from inheriting from their victim. As always, please feel free to contact me at the state Capitol by calling (405) 521-5566 or by emailing brinkley@oksenate.gov. Across the country and right here in our state, weve seen local and national media scrutinize the job of law enforcement in the wake of some very notorious cases. Without a doubt, there are some individuals with a badge who may abuse the authority and power that comes with that position. But I believe those few bad apples are the rare exception. In fact when you look at how many law enforcement officers have been injured or killed in the line of duty, you get a much clearer picture. Here are the numbers. There are approximately 900,000 officers serving in communities across the United States, including the dedicated members of the law enforcement community of our great state. Nearly 60,000 assaults against law enforcement officers are reported each year, resulting in approximately 16,000 injuries. Since the first recorded death in 1791, more than 20,000 law enforcement officers in the United States have made the ultimate sacrifice and been killed in the line of duty, including 488 Oklahoma members of local Police Departments, County Sheriff Offices, Township and County Constable Offices, and other state law enforcement agencies. The names of these dedicated public servants are engraved on the walls of the National Law Enforcement Officers Memorial in Washington, D.C., and 273 new names of fallen heroes are being added to the Memorial this spring. That includes 11 new names of Oklahoma fallen heroes; 3 officers killed in 2014 and 8 officers killed in previous years. If a member of law enforcement has abused his or her position and has broken the law, it is right for the public and the justice system to demand the facts and hold that officer accountable. But again, it is important to remember that these cases are the exception, not the rule. The week of May 10, 2015 is Police Week here in Oklahoma, and throughout the country. I hope you have an opportunity to remember the many dedicated law enforcement officers who risk their lives every single day to make our communities and our state safer places for all of us. They deserve our thanks, and our respect.